Straw yellow tone. An intense bouquet with hints of pineapple and golden delicious apples together with orange and lemon blossoms. On the palate it is ripe and fresh with hints of apples, pineapple, melons and citrus in a harmonious balance. There is a creamy richness on the palate and the finish is long and persistent. The 12 hectare estate lies in the medieval town - founded by the Longobards - of Guardia Sanframondi. The town lies at 428 meters above sea level and overlooks the Valley of the Calore River. In this cool climate a traditional form of Guyot is used, which leaves the grapes suspended beneath the lower wire to absorb heat from the earth. The soil is mainly clay mixed with volcanic ash and limestone. Guardia Sanframondi has a small and very specific D.O.P. 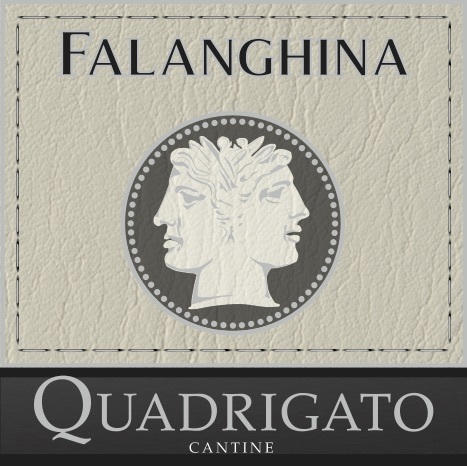 which concentrates on one of Italy’s oldest varietals, Falanghina. Vinification: The grapes are soft pressed and placed in stainless steel. They undergo a slow fermentation at 16-18°C wine is racked before undergoing the malolatic fermentation. Aging: 5 month period on the lees and then a period of refinement in the stainless steel and then in the bottle. Pairs well with seafood, fresh fish, grilled white meats, caprese salad, soft cheeses. QUADRIGATO is a 12 hectare estate that lies in the medieval town of Guardia Sanframondi, that was founded by the Longobards. The philosophy of Quadrigato is well defined by the graphic design of the logo, based on an ancient Roman coin - the Quadrigato that on one of the two sides reproduces the effigy of Janus the God with two faces. In its depictions Janus is always characterized by two faces held together by the neck, and the esoteric and mythological significance attributed to him, always takes on aspects of duality, as Death and Rebirth, Beginning and the End, Past and Future. The face of the Present is always hidden because it cannot be represented since before it is depicted, it is future, after it inexorably becomes past. It is undeniable that this violent negation of the present can be somewhat frightening, but after all it is just so, life is a continuous succession of Past and Future, of Past and Future ... imperceptible moments that represent the clock of the universe. In fact, the present is almost our own invention, something we need to cling to life. This is why, perhaps, having a faith, a dream, an ideal, helps us slow down the inexorable succession of moments, of Past and Future and build apparent feelings of present that are inevitably surpassed and become Past. This constant repetition of Past and Future become the inseparable pair on which our business runs, from the vineyard to the wine, a cyclic series of vintages and seasons of pruning and grape harvests, of fermentation and bottling, of Starting and Ending and a whole series of transitions that are inevitably Past and Future. It may seem a paradox but a bottle or a glass of wine does not escape this rule and, unfortunately, they will never be Present for Quadrigato nor for the consumer. You are wondering, then, what is the style and the philosophy behind Quadrigato...... Simply being aware of everything, not to take pains to become the "characters" that change the rules of the universe, in the conviction to interpret the Past and the Future as Tradition and Innovation, in living every Beginning and Ending as a new season, a new harvest, ... in living it intensely, with the anxiety of not having the time to wait for the next season to make us better. After all, to run our business with love, with passion and even angrily leads us to slow time down ... and to build up a longer and more defined moment that represents our present ... and that becomes the style and philosophy behind Quadrigato. Maybe it is just a moment ... but it is a moment that returns !